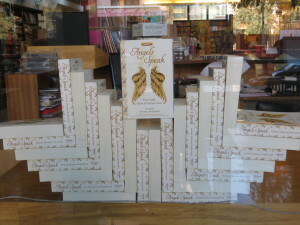 “ANGELS SPEAK ~ YOUR DAILY DOSE OF DIVINE LOVE” ~ The Latest and Best-Selling transformational and healing Book from Roshani Shenazz has been creating waves of healing and transformation to everyone who has been experiencing the book. 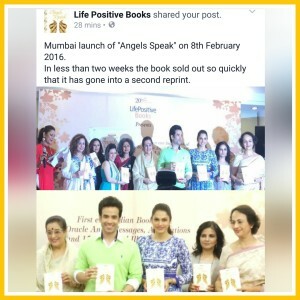 The book has not only been touching many lives across India but has reached the hands of some great change-makers in India and across the Globe. 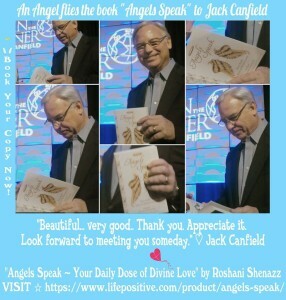 The book has been reached out to Jack Canfield, the renowned Co-Author of the Chicken Soup for the Soul series; Dr. Hanifa D. Mezoui PhD, Senior Advisor Humanitarian Affairs and Civil Society, United Nations Alliance of Civilizations (UNAOC); Mr. Peter (Pece) Gorgievski, C.E.O & Director-General Global Dialogue Foundation; Mrs. Maya Shahani, The Winner of Global Peace Initiative Award – 2015, Chairperson Sage Foundation and Shahani Group and Vice Chairperson NGO, civil society & government organizations at Global Dialogue Foundation; Mr. Subhash Ghai, Director/Producer/Educationist/Visionary; Mr. Dave Rogers, Asia’s renowned Keynote/Motivational Speaker, and Author; Ms. Iliana Schmatelka, Managing Director, International Leadership Institute; Ms. Meghna Ghai Puri, President Whistling Woods International, Mumbai; who are doing great work in bringing a transformation in the World and other renowned personalities like; Neeta Lulla – Designer and Entrepreneur; Actors Tusshar; Manasi Joshi Roy; Mrs. Poonam Shatrughan Sinha; Vandana Sajnani; Monica Tata – renowned Media and Entertainment Consultant; Poetess/ Author – Punam Chadha-Joseph; Omar Qureshi – the famous Film and Entertainment personality and Ex Editor-in-Chief and Creative Head of Zoom TV; and many more who through their innate talents, gifts and skill-sets are making a difference in their own unique ways.